Let there be three. After a memorable five-round scrap that headlined UFC 202 at T-Mobile Arena in Las Vegas on Saturday night, UFC featherweight champion Conor McGregor evened the score with Nate Diaz, winning a razor-thin majority decision in their welterweight bout that put the two rivals at 1-1 and set the stage for a future rubber match. “All I know is it’s 1-1, regroup and we’ll do it again, this time at 155 pounds,” McGregor said. Scores were 48-47 twice and 47-47 for McGregor, now 20-3. Diaz falls to 20-11, and he wasn’t too happy with the verdict. As for Dublin’s McGregor, 28, his stars are aligned again after he bounced back from the lone loss of his UFC career. “Surprise, surprise, #$%$, the king is back,” he said. McGregor opened the fight with kicks to Diaz’ legs, reddening them almost immediately. In the second minute, Diaz got rattled by a left hand upstairs, then dropped with one moments later. McGregor let Diaz rise, and the Stockton native began to get a little busier in order to keep McGregor at bay. But the leg kicks kept coming, forcing Diaz into some wild exchanges, which the calm and collected McGregor won. Less than 30 seconds into round two, another McGregor left hand put Diaz on the deck, and moments later, the Irishman scored yet another knockdown. The always game Diaz kept getting up, but after the third knockdown, his face was bloodied and McGregor wasn’t even breathing heavy. That would change though, and with under two minutes left, Diaz began pressuring McGregor and the crowd roared, especially when he drilled his foe with combinations as he bulled him into the fence. With the tide now turning, Diaz put the pressure on again in round three, and he was gaining the upper hand on the tiring McGregor. Diaz sensed it too, as he began taunting his opponent as he looked to wear him down against the fence. When they broke, McGregor was clearly winded and Diaz was loving it, and in the final minute, Diaz poured it on, landing with punch after punch as the crowd erupted, with only the horn keeping McGregor from a near certain finish. Diaz was visibly bothered by a cut over his right eye, and the blood was clearly affecting his vision in round four. Buoyed by his sudden good fortune, McGregor seemed to be getting back in a rhythm, digging shots to the body and head. 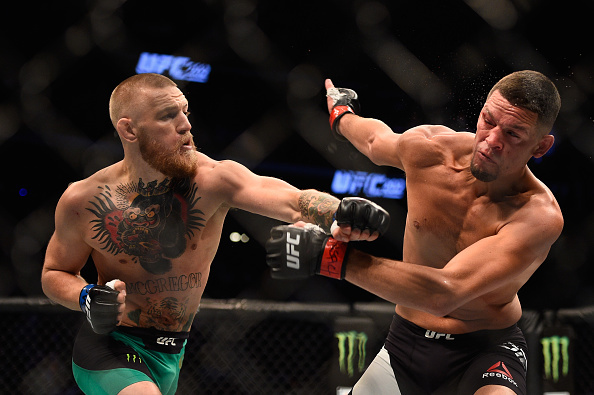 Diaz responded with a takedown attempt, but McGregor fought it off. Diaz kept his foe pinned to the fence though, and Diaz was winning those close range exchanges until McGregor turned things around and got loose with under two minutes left. Then he was able to stay a step ahead of Diaz until the horn sounded. The crowd stood and cheered before the fifth final round commenced, and despite the blood and fatigue, both fighters continued to go to war. McGregor was choosing his spots to attack, and when he stopped, Diaz went on the attack, nearly getting a takedown. With two minutes to go, Diaz went fishing for a takedown again, but came up short, and the two landed short shots at close range against the fence. McGregor tripped Diaz to the mat with a minute left, but Diaz rose immediately and got a takedown with seconds to go. The final horn soon intervened, but when it was over, it was Diaz extending a hand to McGregor to help him up and the two showed the respect that only 25 minutes of battle can produce. “He’s a helluva competitor, he brought out the best in me,” McGregor said.